GearBuyer has the largest selection of men's down jackets from The North Face, Burton, Patagonia, Columbia, Arc'Teryx, Marmot, Mountain Hardwear, Spyder and more. Marmot Guides Down Hoody - Marmot knows quite a lot about down jackets - they were the company's first product when it was founded in the late '70s. The Guides Down Sweater is the most iconic and long-running Marmot down jacket, and by popular demand, Marmot has added a warm, insulated hood to that classic design to create the Guides Down Hoody. Filled with 650-fill goose down and weighing in at 657 grams, the Guides Down Hoody bridges the gap between sewn-through down sweaters and fully-baffled expedition jackets. Marmot Guides Down Sweater - The sun sets over Glacier National Park before dinner starts, and the temperatures plunge. 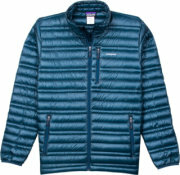 Slide on the Marmot Men's Guides Down Sweater and enjoy its lofty warmth as you enjoy your meal. Marmot treated this jacket's 700-fill down insulation with Down Defender to resist water in case a light drizzle or snowshower hits your site. And the durable polyester shell and lining have a water-resistant coating so you're doubly protected against wet weather. 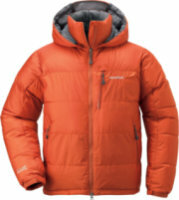 Patagonia Ultralight Down Jacket - Patagonia Men's Ultralight Down Jacket. The Ultralight Down Jacket is our lightest-weight insulating full-zip down layer, with a slim silhouette for thermal efficiency, a superlight 100% nylon shell and a DelugeDWR (durable water repellent) finish. As minimal as an eight-piece rack on an alpine ridge, our new Ultralight Down Jacket supports ascent without excess. It features top-notch 800-fill-power premium European goose down and an updated, ultralight yet super tough shell fabric that blocks wind and sheds snow with its a DelugeDWR (durable water repellent) finish. 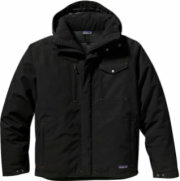 Patagonia Rubicon Down Jacket - Patagonia Men's Rubicon Down Jacket. Warm, versatile and durable, the Rubicon Down Jacket is a performance-riding workhorse that’s part of every local’s quiver. 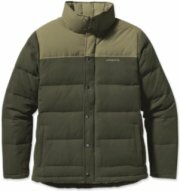 The 600-fill-power European goose down insulation keeps warmth in and a bomber polyester rip-stop fabric keeps elements out. Local. Full timer. Anyone who simply lives for the next day on snow. We make the Rubicon Down for you. It’s our workhorse insulated jacket - warm, performance-oriented, and in it for the long haul. 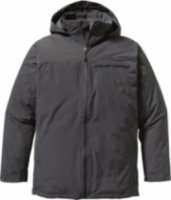 Marmot Mountain Down Jacket - Getting out of a sleeping bag during cold weather is rough work unless you have the Marmot Men's Mountain Down Jacket to slide into. Waterproof breathable MemBrain fabric and 650-fill down insulation make the Mountain Down an excellent choice for a range of alpine adventures, from skiing to mountaineering. 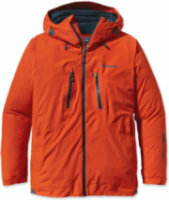 And Marmot covered the sleeves, hood, and shoulders with durable nylon Cordura to handle all the abuse you dish out. Angel-Wing Movement allows you to move freely in the Mountain Down without it riding up. 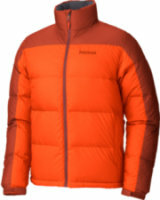 Patagonia Bivy Down Jacket - Patagonia Men's Bivy Down Jacket. 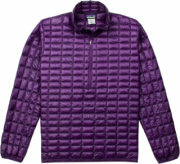 A quilted nylon canvas coat insulated with 600-fill power premium European goose down; it has two insulated hand pockets and a snap placket. When fall’s to-do list keeps you toiling deep into winter, you’ll be thankful for your quilted Bivy Down. Insulated with 600-fill power premium European goose down to warm December’s icy temperatures, it has a robust yet limber nylon canvas shell with a DWR (durable water repellent) finish on shoulders and collar for tackling jobs in any condition. 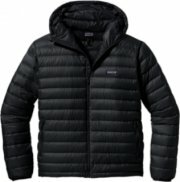 Patagonia Ultralight Down Hoody - Patagonia Men's Ultralight Down Hoody. The durable Ultralight Down Hoody is built with our lightest-weight fabric and highly compressible 800-fill-power goose down. With its low-profile hood and a slim, thermally efficient silhouette, it layers easily or stands alone in cold conditions. Early starts and late days, mountain summits and shaded belays – all reasons to maximize the spring season and throw in compressible high-loft insulation. Our Ultralight Down Hoody uses top-notch 800-fill-power premium European goose down that traps your heat, and an updated, ultralight yet super tough shell fabric blocks wind and sheds snow with its DelugeDWR (durable water repellent) finish. 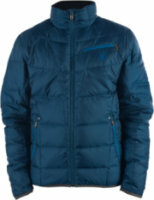 Patagonia Primo Down Jacket - Patagonia Men's Primo Down Jacket. Lighter, warmer and with a new articulated fit, the Primo Down Jacket features 2-layer GORE-TEX® fabric for durably waterproof/breathable and windproof protection with 800-fill-power goose down to keep you stoked in the harshest elements, from frigid dawn patrol missions to stormy laps in the trees. Riding Jackson Hole in cold, turbulent weather can be an opportunity to revel or a one-way ticket to misery. The difference depends on staying warm, dry and stoked. Marmot Guides Down Vest - Marmot Men's Guides Down Vest. Simple, lightweight and compact, the Guides Down Vest is insulated with 700-fill power down treated to make it water resistant and resilient in unexpectedly damp environments. The treatment allows the down to retains its powerful loft in damp weather and provides that extra edge in protection-no added bulk or frills. Pack the vest into its pocket for easy stow or go. 700 Fill Power Down with Down Defender. Ride Capitol Down Jacket - Ride Capitol Down Jacket - Men's:The Capitol Down Jacket has a 15k/10k waterproof breathable rating, Fully Taped Seams & features Strata HD II fabric that makes for one super warm & waterproof down jacket. Offering top protection in all conditions, this collection features fashion driven performance. It is treated with Ride’s exclusive Strata HD II technology, boasting a 15K/10K waterproof/breathable rating and includes a long list of Rideractive features to meet all your Riding needs. 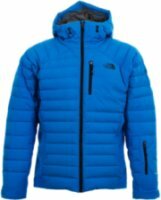 The North Face Point It Down Jacket - Backcountry skiing in the middle of winter can either be very fun or terribly numb depending on whether you have The North Face Men's Point It Down Jacket on or not. Having 700-fill water-resistant goose down insulation wrapped around your body provides all the toasty warmth you need while you ski across that winter wonderland, and the down stays warm even if it gets wet. Plus, The North Face added 100g PrimaLoft One insulation in the side panels to reduce that bulky feeling most down jackets are known for. 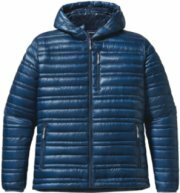 Montbell Alpine Light Down Jacket - The MontBell Men's Alpine Light Down Jacket is just waiting to warm you in the mountains, and it'll do so without clearing out your bank account. The premium 800-fill down insulation provides incredible warmth without making you feel like you're wearing twenty heavy blankets. And both the shell and lining have wind-resistant Ballistic durability for long-lasting strength against rocks, trees, and other sharp objects out in the wilderness. When it gets warm out in the woods, you can compress this jacket down to about the size of a Nalgene bottle and stash it in your pack in case it gets cold again. Millet Expert Down Jacket - Summit days are hard enough without freezing, so pack the Millet Expert Down Jacket to keep your core toasty for the last couple thousand feet. Millet updated this jacket from previous models by going with 700-fill down, which keeps the weight under two pounds without sacrificing warmth. Whether you use this jacket for belaying a pitch of ice or plodding up an alpine ridge, you'll be happy you brought it along..
Montbell Permafrost Down Parka - Rope up and venture deep into the heart of the high alpine while wearing the MontBell Men's Permafrost Down Parka. This is a technical insulator for the foulest winter weather a guide or professional athlete will encounter. On the outside, it features highly-durable WindStopper fabric to fend off the wind, and on inside, there's enough high-loft goose down insulation to provide nearly endless warmth. It stashes down into a compact stuff sack and wears well alone and under your weatherproof shell. 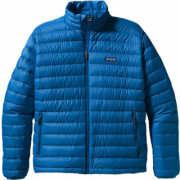 Patagonia Interlodge Down Jacket - Patagonia Men's Interlodge Down Jacket. Urban warmth with a technical soul: This durably waterproof coat is made with 2-layer GORE-TEX fabric, 600-fill-power premium European goose down insulation, an insulated, removable hood and watertight zippers. The Interlodge takes its name from Little Cottonwood’s avalanche lockdown, so count on it to keep you sheltered when it’s raging outside. Made from 2-layer, recycled nylon GORE-TEX fabric that’s durably waterproof/breathable and windproof, it’s insulated with 600-fill-power down to keep you warm and dry in saturated, chilling conditions. 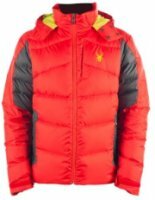 Spyder Rocket Down Jacket - Every skier dreams of a durable down jacket with fluffy warmth that can take a beating at the resort, which is why Spyder gives you the Men's Rocket Down Jacket. You get that everlasting, wonderful warmth we all admire with 700-fill goose down insulation, except Spyder welded the baffles for long-lasting durability against the corduroy-cruising, ice-scraping, and snow-plowing adventures we call skiing. An Xt. L laminate protects the down with waterproof qualities, fully taped seams keep you dry in wet weather, and waterproof zippers over all external openings give this jacket waterproof protection in ways that your hardshell might not even dream of. 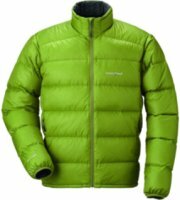 Spyder Diehard Down Jacket - Spyder Diehard Down Jacket - Men's: For down diehards, the Down Diehard is Spyder’s answer to a traditional puffy jacket. Features a Down proof Polyester Flat Twill weave finished with Spylon™ DWR, 600 fill Power Down Insulation, fixed hood, two way center front zipper, and Velcro adjustable cuffs. Brushed inner collar feels soft against skinHem drawcord cinches to seal out cold airVelcro adjustable cuffs fit around gloves to keep out snowAttached hood for weather protectionSpylon™ DWR repels water and liquid stainsInternal zippered pocket for secure storage2 zippered hand pockets keep fingers warmChest pocket holds gear. Spyder Dolomite Down Vest - A warm, form-fitting layer, the Spyder Dolomite Down Vest protects you deep in the mountains or just outside the door of your ski-out condo. 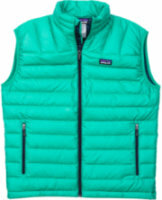 This stylish vest wraps your torso in 700-fill down and seals you off with an elastic hem. A set of pockets add storage and keep fingers when the vest is worn as an outer layer. Specs:Features:Stand collar; zipper closureElastic hem keeps out cold airSpyder men's down vestSpylon™ DWR repels water and liquid stainsZipped chest pocket and waist pockets2 zippered hand pockets keep fingers warmChest pocket holds gearImportedSleevelessMachine washable.